With late night temperatures headed into the 30s and winds whipping out of the fridged North-West, racers and race fans alike did what they always do in early October . . . wrapped themselves in several layers of their favorite racing attire and headed to MISSISSIPPI THUNDER SPEEDWAY to wrap up the racing season with the Fall Festival . 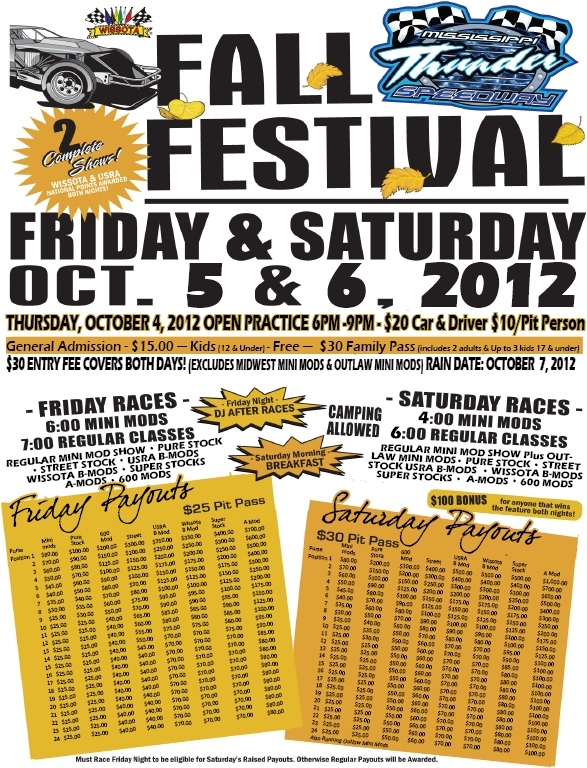 . .
For the fourth year in a row, the 2012 racing season will wrap up with the FALL FESTIVAL at MISSISSIPPI THUNDER SPEEDWAY. 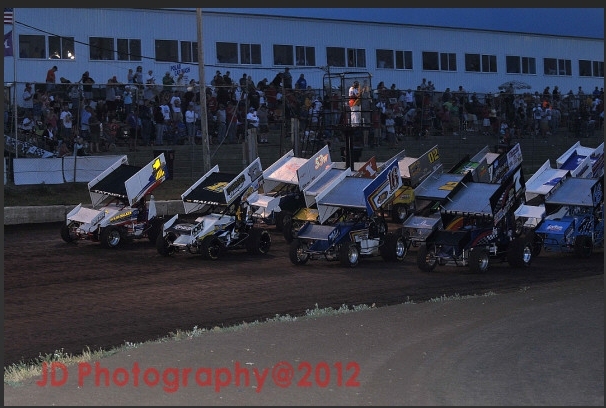 After an extremely successful Baehman Law B-Mod Nationals at the beginning of September, the racing world far outside of Southeastern Minnesota and Westcentral Wisconsin have become aware of the pearl that quietly but quickly is growing in Fountain City, WI. Drivers, Sponsors and fans all came away from MISSISSIPPI THUNDER SPEEDWAY realizing that the facility, the track and most importantly the on-track competition is amongst the group at the top of the list of best possible dirt-track racing. Because of this, many are looking forward to returning to MISSISSIPPI THUNDER SPEEDWAY for the Fourth Annual Fall Festival on October 5th and 6th . 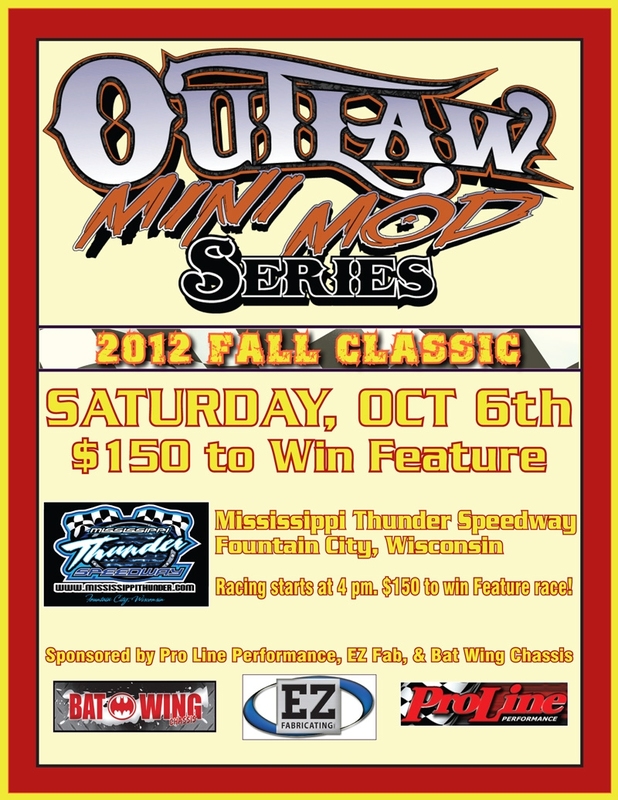 . .
MISSISSIPPI THUNDER SPEEDWAY is extremely happy to welcome the OUTLAW MINI-MOD SERIES back to the area for action on the LIGHTNING SPEEDWAY, as part of the Saturday October 6th event schedule as a support series of day number two of the 4th ANNUAL FALL FESTIVAL! It's not only the "Big Cars" which will be racing for big cash, at the FOURTH ANNUAL FALL FESTIVAL October 5th and 6th at MISSISSIPPI THUNDER SPEEDWAY; a group of event sponsors have pooled their resources and are putting up extra money for the REDBOX+ 600 Modified division! Both Friday's and Saturday's 600 Modified features will pay $700 to win with extra money also being added through the top-5 finishing positions! 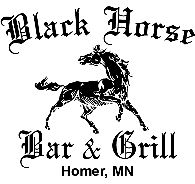 Elizabeth, MN's Travis Saurer has many reasons to be happy this weekend - ten thousand of them, to be exact!! After the three-days of on-track action with over 160 competitors giving their all, Saurer raced his way to the top of the heap and collected the $10,000 pay check for winning the Baehman Law B-Mod Nationals main event at MISSISSIPPI THUNDER SPEEDWAY!! The road leading to the unprecedented $10,000 payday for the B-Modified main event win was not easy; but Saurer put his experience, enthusiasm and lucky rock to work for him, and in the end he was standing next to his #21 on the MISSISSIPPI THUNDER SPEEDWAY Victory Lane and holding the huge event trophy, the oversized $10,000 check and basking in the glow of crowd's cheers and the understanding that he'd just beaten the best of the best from B-Mod divisions in three different sanctioning bodies across 10 different states . . .
$10,000 is on the line for the winner of the Saturday September 8th Baehman Law B-Mod Nationals feature. But, before a driver can collect that $10,000 paycheck, they need to first quality for the Saturday feature. Qualifying for Saturday's main event began Thursday the 6th as the top-10 finishers in the night number 1 main event were awarded a guaranteed starting spot in Saturday's feature. And the road to Thursday's A-Main was a challenge in itself as qualifiers for the night one feature had to work through first 11 heat races, and then 6 last chance qualifier "B-Mains". From the heat races, the finishers with the top-14 passing points accumulated transferred directly to the evening's main event. The rest of the 150 cars were dropped into the 6 "B-mains" from which only the top three finishers transferred to the A-Main to round out the 32 car field. Waterloo, IA's Tyler Droste who transferred directly into the evening's A-Main from the 11th and final heat race, battled hard through the 25-lap feature and stole the win with last lap, final straight pass for the win . . .
Each week racers converge on their local race track in hopes of an evening of fun, excitement and strong results; put together a complete season of consistent strong results, and those drivers are rewarded with a rewarding position in the track point standings. 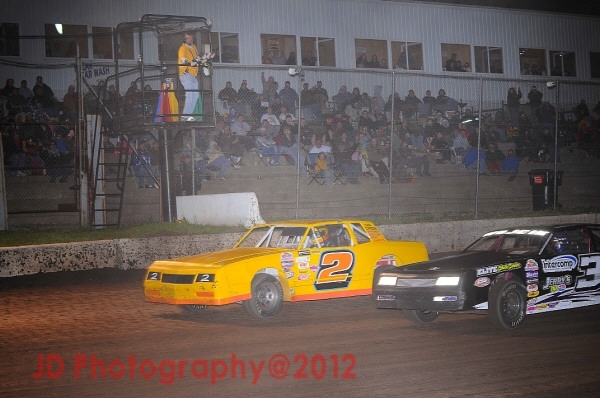 This past Friday, the season-long battles throughout the 2012 track point standings at MISSISSIPPI THUNDER SPEEDWAY, were wrapped up with the final points paying night of regular season on-track action as part of the Season Championship program presented by NAPA Auto Parts of Winona. Coming into the evening, only one driver, out of the six weekly divisions which compete on the fast 1/3-mile, had a 2012 MISSISSIPPI THUNDER SPEEDWAY Track Championship mathematically locked up, the other five championships were still up for grabs . . . The name Kelly Shryock is synonymous with winning; the well-known statistic of 9 USMTS National Championships backed by over 370 feature wins lets every racer and race fan know that when he shows up at the track with his #3, he's a threat for the win. 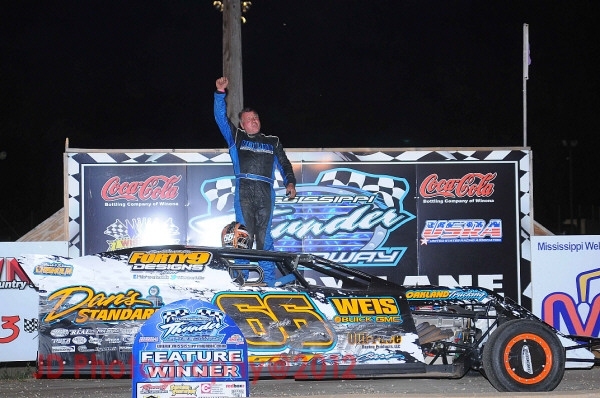 Anyone who follows Modified racing also knows of his Skyrocket chassis, which have also become synonymous with winning; being used by modified drivers throughout America to help other drivers reach Victory Lane as well. Friday August 24th Shryock arrived at MISSISSIPPI THUNDER SPEEDWAY not only to race, but also to give the racing world the very first official on-track unveiling of the brand new 2013 Skyrocket chassis. To say that things couldn't have gone any better would be an understatement . . .
Jon Tesch of Watertown, S.D., ended his dry spell just 17 days shy of the one-year anniversary of his last USMTS victory as he took the lead from Jason Hughes on lap 17 Friday night to score the victory at the Mississippi Thunder Speedway . . .
HUNT FOR THE USMTS CASEY’S CUP MARCHES ON WITH A FRIDAY AUGUST 17TH VISIT TO MISSISSIPPI THUNDER SPEEDWAY! After a four-race opening weekend, drivers competing in the Hunt for the USMTS Casey’s Cup get two days off before resuming their epic battle for the $15,000 champion’s check with five events at five dirt ovals in Iowa, Minnesota and Wisconsin this Wednesday-Sunday, Aug. 15-19 -- including this Friday August 17th $3,000 to win visit to MISSISSIPPI THUNDER SPEEDWAY. Also joining into the on-track action will be the TheEngineStore.com USRA B-Mods, Jailhouse Saloon WISSOTA Street Stocks, Redbox+ 600 Mods, & Elmer's Auto Salvage M.T.S. Pure Stocks battling for positions on the fast 1/3-mile AND the Sunshine A & B Mini Mods will be joined on the "Lightning Speedway" by the super-fast OUTLAW Mini Mods as they race for their $500 to win 2012 Summer Nationals! Excitement, drama, uncertainty, and patriotism; the 2012 Mid Summer Shoot Out at MISSISSIPPI THUNDER SPEEDWAY provided race fans with just about every possible emotion as racers hit the high-speed 1/3-mile dark clay oval for the two-day special event to start off the month of August. By the time the final checkered flag had waived Saturday evening, just about every scenario possible had played itself out for the weekend; an exciting battle to the finish line by Kelly Anderson and Tommy Richards which was decided by mere inches, Greg Wohletz and Bob Cisewski grabbing the very first feature wins of their racing career, point leader Erik Kanz experiencing victory and mechanical failure with his USRA B-Mod, and heavy rains Saturday morning providing fans and racers alike with a reminder that Mother Nature cares little about dirt track racing. But overshadowing all of this was dominance by Lucas Schott and Doug Wojcik who gathered feature wins on both nights in the USRA Modified and WISSOTA Street Stock divisions . . .
TWO DAY MID-SUMMER SHOOT OUT COMING FRIDAY AUGUST 3RD AND SATURDAY AUGUST 4TH TO MISSISSIPPI THUNDER SPEEDWAY! MISSISSIPPI THUNDER SPEEDWAY is preparing to break up the mid-summer doldrums with the two day Mid-Summer Shoot Out Friday August 3rd and Saturday August 4th! 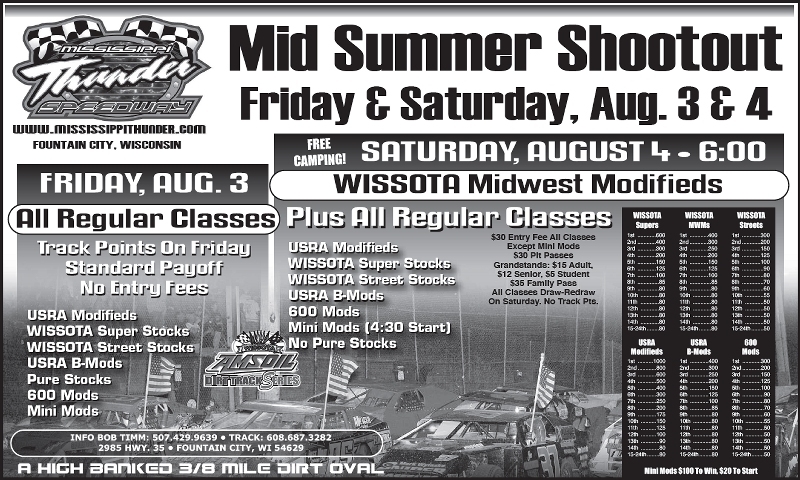 The Mid-Summer Shoot Out will be two complete shows for all regular classes with the addition of the WISSOTA B-Mod class on Saturday and there will be extra pay on Saturday in all classes - Friday will be a regular paying show with track points! A DJ (with Music and Karoke) will be on-site Friday night following the evening's final checkered flag - to help fans and racers alike enjoy the evening with music and fun deep into the night! Camping available on the speedway grounds, so bring the entire family and make a weekend experience out of the Mid-Summer Shoot Out at MISSISSIPPI THUNDER SPEEDWAY! 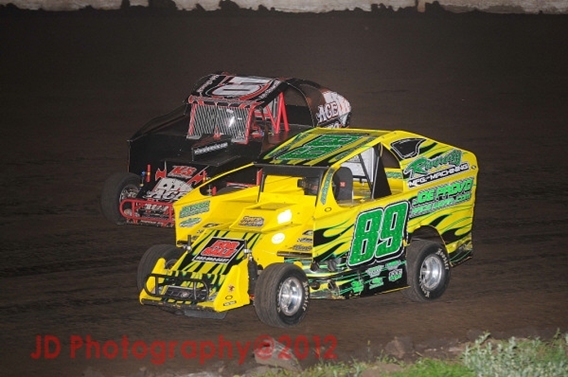 Sunshine Sanitation "A" & "B" Midwest Mini Mods competing on the "Lightning Speedway"! After the final checkered flag! For the fourth time in the four-year existence of MISSISSIPPI THUNDER SPEEDWAY Jack Baehman and his Beahman Law law firm rolled out the red carpet for USRA B-Mod racers with his big-money B-Mod Challenge. With $1000 on the line for the winner of the TheEngineStore.com USRA B-Mod 30-lap feature (and a guaranteed $100 to start) the field filled out nicely presenting the race fans in attendance with 3 heats and full 24-car starting lineup for the main event. Regular weekly racers were joined by a healthy contingent of first-time visitors to the Fountain City, WI 1/3-mile dark clay speedway - and by the time the evening's $1000 checkered flag was waiving, drivers from both of those groups had shown their best, but it was a member of the "Youth Brigade" collecting the big paycheck. While not a member of that "Youth Brigade, even event sponsor Jack Baehman enjoyed some laps at the front of the field during the evening's third heat race, before finishing second to Cottage Grove, MNs Ben Moudry - but it was Chatfield, MN racer Jacob Bleess who showed, once again, that when a large payout is on the line, he's capable of ignoring any pressures and challenges and focusing strictly on getting his EZ Fabricating #21 to the front of the field, and keeping it there. 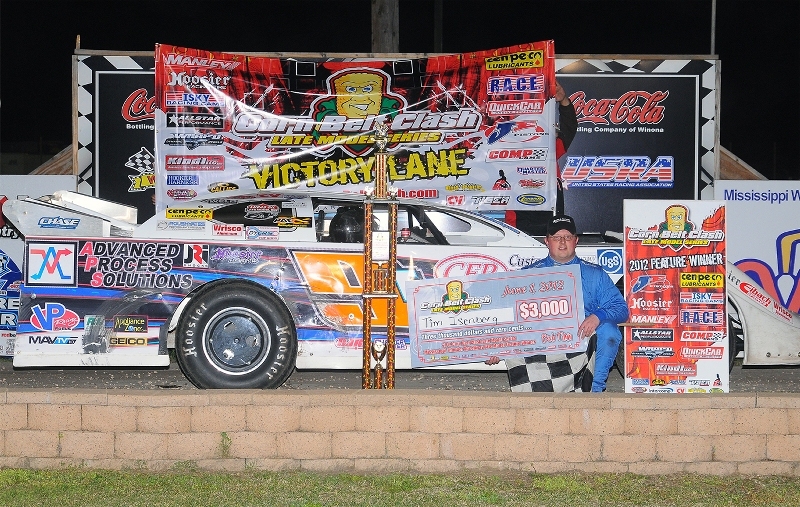 Just two weeks after collecting a $1700 pay day for winning the USRA B-Mod feature during the fourth annual Rivercity Rumble, Bleess was signing his name on the over-sized $1000 winner's collectable check as the winner of the Baehman Law B-Mod Challenge . . .
20 photos available for viewing within the event results article! 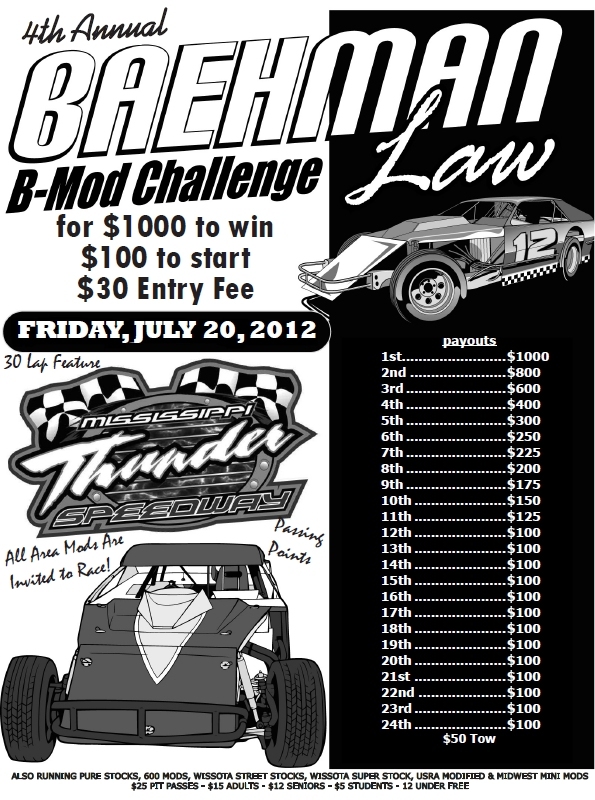 BAEHMAN B-MOD CHALLENGE COMING TO MISSISSIPPI THUNDER SPEEDWAY JULY 20TH! For the fourth year in a row, Baehman Law is ready to celebrate the USRA B-Mod division by hosting the $1000 to win Baehman Law B-Mod Challenge at MISSISSIPPI THUNDER SPEEDWAY . . . It was a history making night at MISSISSIPPI THUNDER SPEEDWAY as the Bumper to Bumper IRA Outlaw Sprint Series made its first appearance at the 1/3 mile dirt oval. Fans who visited the raceway which was built just four years ago got their first taste of open-wheeled 410 sprint action and they would not go home disappointed. 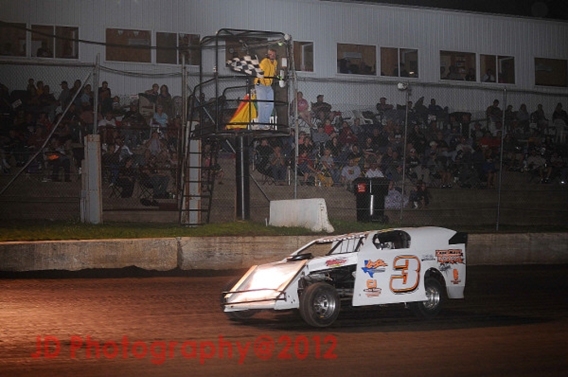 The evening was full of anticipation as both the raceway and series officials were fighting incoming weather. Mother Nature teased at postponing the event, as rain began to fall when the 30 lap A-main event began to stage on the front stretch. However, when the brief shower ceased officials were able to push off the field and the event completed before any additional rain arrived at the raceway. 17 photos available for viewing within the event results article! 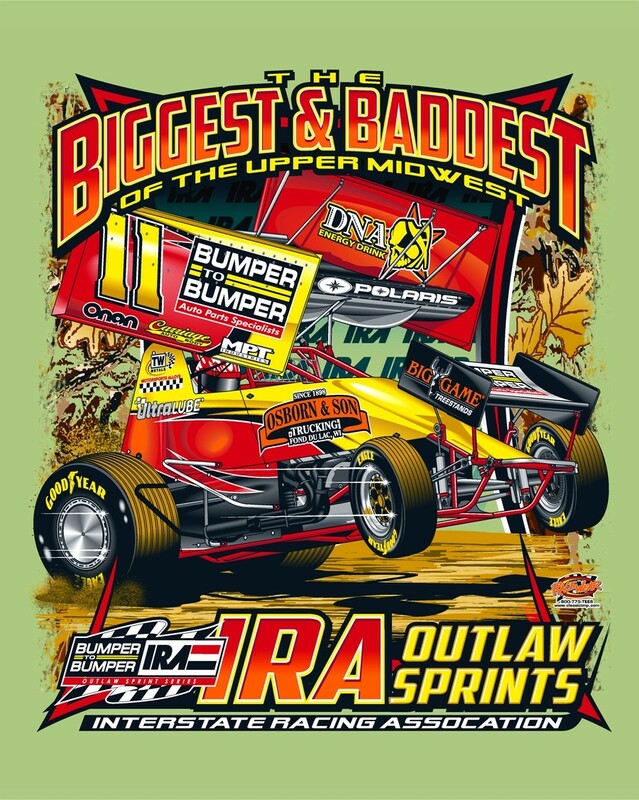 IRA SPRINT CAR SERIES COMING TO MISSISSIPPI THUNDER SPEEDWAY JULY 13TH! Don't even think about letting the fact that it'll be FRIDAY THE 13TH scare you away from MISSISSIPPI THUNDER SPEEDWAY this week! 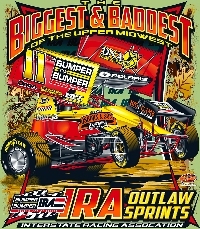 Just one week after the 4th Annual Rivercity Rumble, the high banks and long sweeping turns of MISSISSIPPI THUNDER SPEEDWAY will be rumbling for a different reason as the Bumper to Bumper IRA Outlaw Sprint Car Series thunders into the area raw horse power and speeds never before witness at the Fountain City, WI Speedway! In addition to the 5 32 inch flat screen TVs, and the hundreds of dollars in cash prizes, and gas cards, and bicycles, and t-shirts, and water-balloon tosses . . . the 4th Annual Rivercity Rumble, presented by Rivercity Manufacturing & Machining and R & R Machining, provided race fans with some excellent on-track action as over 120 racers battled for their share of an almost $30,000 potential purse at MISSISSIPPI THUNDER SPEEDWAY! Surprise winners, bumping and banging for the lead, and big-named visitors was the name of the game in all five divisions competing on the fast 1/3-mile MISSISSIPPI THUNDER SPEEDWAY as well as both divisions of Mini-Mods racing on the smaller "Lightning Speedway" in the MTS infield . . . .
14 photos available for viewing within the event results article! 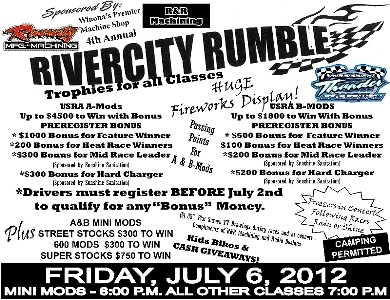 4TH ANNUAL RIVERCITY RUMBLE IS COMING TO MISSISSIPPI THUNDER SPEEDWAY JULY 6TH! Trophys, Fireworks, Kids bike giveaways, a live concert by the Freezers . . . what more could racers and race fans ask for?! Well, since the racers could ask for more money, and the fans could ask for a stacked field of top-notch competitors battling for that extra cash . 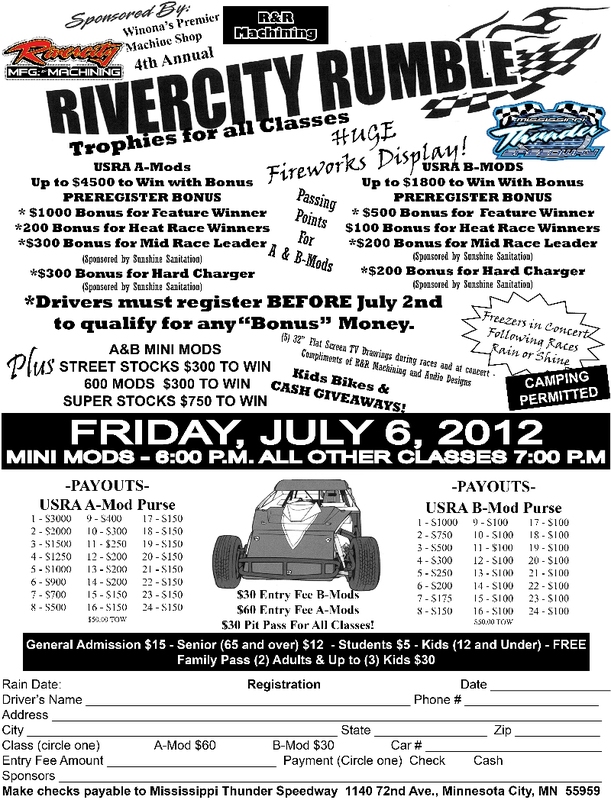 . . that's EXACTLY what MISSISSIPPI THUNDER SPEEDWAY is doing for the 4th Annual Rivercity Rumble - scheduled for July 6th 2012! Many results articles have been written about a driver's first feature win - and racers and race fans alike do enjoy reading about that first checkered flag. But, probably the next most popular "Feel Good" story line is when a long-time track regular finally makes a return trip to victory lane after an extended absence. That's the story line we're following after Friday's racing action at MISSISSIPPI THUNDER SPEEDWAY compliments of an impressive feature win by Kellogg, MN's Kevin Hager . . . .
9 photos available for viewing within the event results article! Under beautiful blue skies, with perfect temperatures and a comfortable breeze, race fans converged on MISSISSIPPI THUNDER SPEEDWAY to enjoy top-notch dirt-track action and an evening of family fun as part of Sugar Loaf Ford of Winona night at the Fountain City, WI speedway. "Big Mike" Walski and Sugar Loaf Ford decided that Friday June 22nd was a great date upon which to throw some extra money at the racers as a reward if they could successfully find their way to Victory Lane at the end of the evening's feature races. To that end, a $100 bonus was on the line for the winners of the night's features in the top four weekly divisions which compete at MISSISSIPPI THUNDER SPEEDWAY; therefore, the drivers in the Rivercity Manufacturing USRA Modifieds, the Coordinated Business Systems WISSOTA Super Stocks, the TheEngineStore.com USRA B-Mods, and the Jailhouse Saloon WISSOTA Street Stocks each had 100 extra reasons to race just a little bit harder to get to the checkered flag first! Speaking of "first"; Friday evening brought forth a couple more "First-Time winners" for the race fans to salute and applaud. While names like Doug Wojcik, Lucas Schott & Jacob Bleess were being mentioned in the MISSISSIPPI THUNDER SPEEDWAY Victory Lane for the second time in this 2012 season, there were two new driver names being introduced to the race fans in the stands - Bruce Schmidt and Shawn Huse each enjoyed their first feature wins at MISSISSIPPI THUNDER SPEEDWAY . . . .
21 photos available for viewing within the event results article! SUGAR LOAF FORD NIGHT IS COMING JUNE 22ND, WITH PRIZES FOR THE FANS AND EXTRA MONEY FOR THE WINNERS! Mike Walski of Sugar Loaf Ford is excited to announce Sugar Loaf Ford night Friday June 22nd at MISSISSIPPI THUNDER SPEEDWAY. In addition to the many normal free prizes to be given away to the fans, Mike announced that Sugar Loaf will also be stepping it up this year for the Drivers as well. 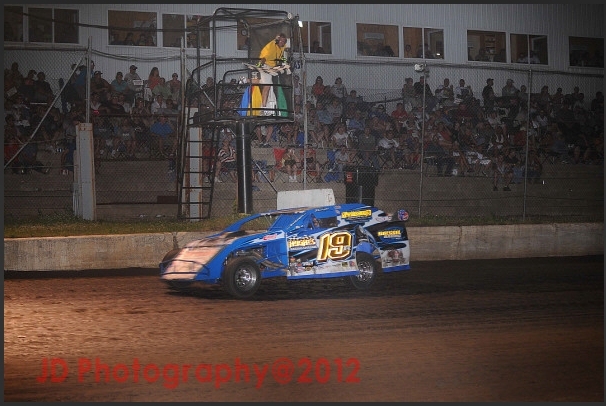 Sugar Loaf Ford will be adding $100.00 to the first place position in Street Stock, B -Mods, Super Stocks, and Modifieds. With much more to race for than just a checkered flag, the action at MISSISSIPPI THUNDER SPEEDWAY was as hot as the threatening, thick and humid mid-June weather. Anyone looking at an internet weather forecast might have made the decision that racing was not going to happen; but instead of the forecasted "100% chance of rain" at 7 PM, those race fans who gambled against "Mother Nature" were treated to "100% on-track action"! 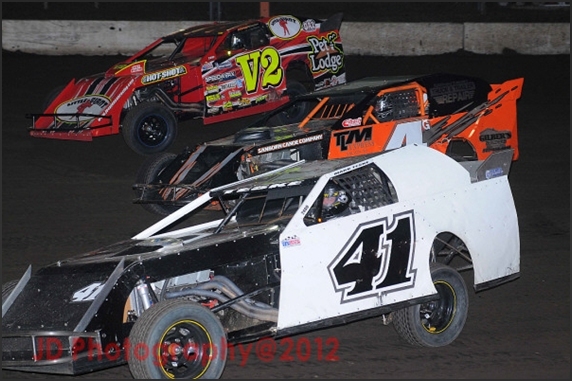 In addition to critical track and season points, the Coordinated Business Systems WISSOTA Super Stocks and Jailhouse Saloon WISSOTA Street Stocks were racing for a guaranteed position in the 2012 WISSOTA Race Of Champions which would be awarded to the winner of the evening's features. The Super Stocks were also racing for yet another $200 feature winner bonus compliments of Coordinated Business Systems, Kyocera and J-Mev Motorsports. TheEngineStore.com USRA B-Mods were racing to dethrone 14-year old Alex Williamson, who'd picked up his very first feature win just the previous Friday evening in a convincing display of speed and driver abilities. The River City Manufacturing USRA Modifieds learned at the last minute before opening ceremonies that they would be racing against 9-Time USMTS National Champion Kelly Shryock - who showed up at MISSISSIPPI THUNDER SPEEDWAY for a little USRA fun. The Redbox+ 600 Mods were all trying to find a way to tie an anchor onto the rear-end of Joe Provinzino, who'd already piloted his JoeProvoRaceWear.com #89 to four feature wins through the opening weeks of competition on MISSISSIPPI THUNDER SPEEDWAY's 1/3-Mile oval. All of this and more . . . .
13 photos available for viewing within the event results article! A win is a win; that saying is true enough. In our sport the main goal is, of course, beating the competition to the checkered flag. A heat race win can feel like a cool glass of water on a blistering summer day . . . but it's the main event that can really quench a driver's thirst for victory. Once a racer gets that first feature win of the season on the books, things change just a little. It can, in many cases, help the driver get started on the road to several additional successes. Yes, racing at the local level is centered on fun and enjoyment at the track; but a feature victory is the icing on the cake that makes the fun so much sweeter! Friday June 8th saw six (SIX!) 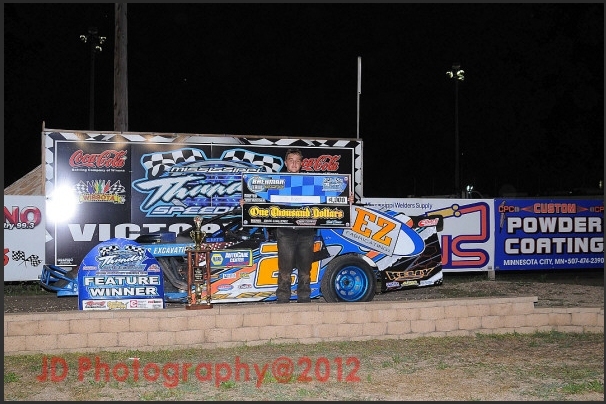 first time feature winners for the 2012 season at MISSISSIPPI THUNDER SPEEDWAY! 19 photos available for viewing within the event results article! Nathan Kilwine and the OUTLAW MINI MOD SERIES are excited to return to MISSISSIPPI THUNDER SPEEDWAY for the second evening of the 2012 Three-Night Series! Friday night, June 15th, will be the second event of this special three-night series which will culminate with a $500 to win finale at MISSISSIPPI THUNDER SPEEDWAY on Friday August 17th. "We're really looking forward to this event!" said Kilwine when releasing the details for this special . 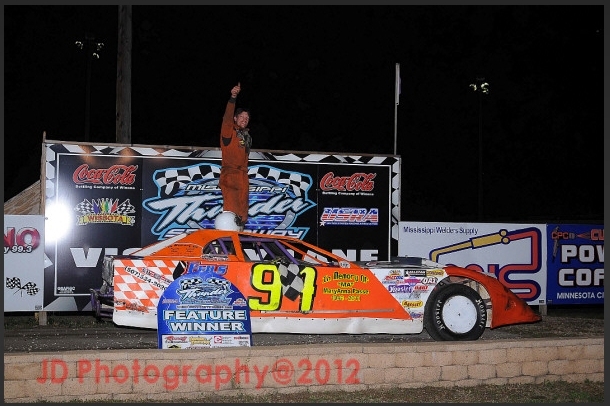 . .
Tim Isenberg's bridesmaid status with the Corn Belt Clash Late Model Series is now over. 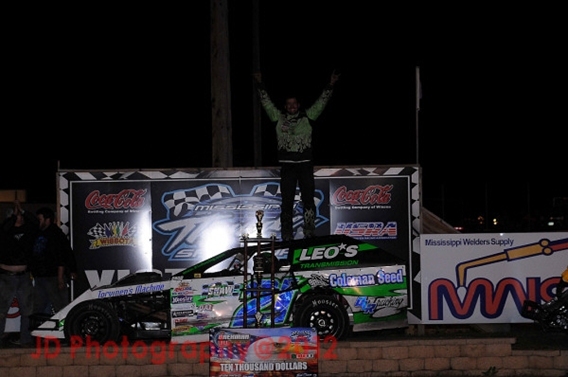 The Marshfield, Wisconsin driver who had nine runner-up place finishes last season, broke through into CBC victory lane during KG-Bud Night at MISSISSIPPI THUNDER SPEEDWAY. 22 photos available for viewing within the event results article! 5-29-2012 UPDATE: WISSOTA Super Stocks added - with $400 Feature winner Bonus from Coordinated Business Systems, Kyocera & J-Mev Motorsports! 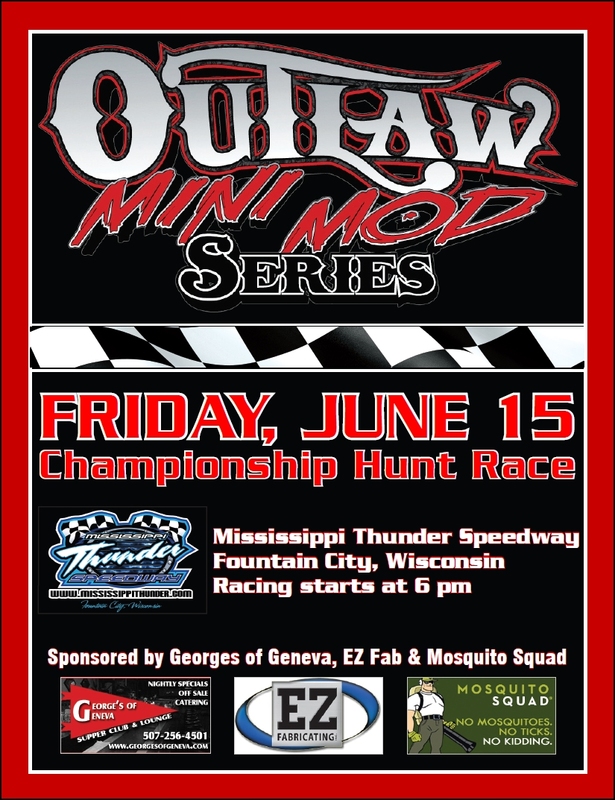 MISSISSIPPI THUNDER SPEEDWAY is excited to roll out the red carpet for the ultra powerful, super competetive CORN BELT CLASH LATE MODEL SERIES which will make a stop at the West-Central Wisconsin power-plant on Friday June 1st! Big money is on the line with the $3000 to win $300 to start special event which is sure to bring the best Late Model drivers in the upper midwest, and beyond, to one of the best dirt tracks in the upper midwest, and beyond. Friday night, June 1st, is sure to be a great event for all race fans as the Corn Belt Clast Late Model Series will be joined by a full card of regular weekly divisions from MISSISSIPPI THUNDER SPEEDWAY also competing that evening - Rivercity Manufacturing USRA Modifieds, Coordinated Business Systems WISSOTA Super Stocks, The Engine Store.com USRA B-Mods, REDBOX+ 600 Mods, Elmer's Auto Salvage MTS Pure Stocks as well as the Sunshine Sanitation A & B Mini Mods. As a side note, a combination of events means that the Coordinated Business Systems WISSOTA Super Stocks (which were added to the schedule just this past weekend) will be racing for quite a bit more money for the evening's feature winner. Because of the "Progressive Winner's Bonus" provided by Coordinated Business Systems, Kyocera & J-Mev Motorsports and the rain out for the Super Stock program this past week (Friday May 25th), the competitors in this Friday's Coordinated Business Systems WISSOTA Super Stock feature will be racing for an extra $400 bonus ABOVE the regularly posted Super Stock payout! Bring the family, bring the friends, bring the neighbors! This Friday night is sure to be a "Fast and Furious Friday night of Fantastically Affordable Family Friendly Fun"!! Race fans who were in attendance for the rained out May 25th event CAN use their ticket stubs as admission to the Corn Belt Clash Late Model Series SPECIAL EVENT, but will have to pay the difference in admission price. Those same race fans also have the other option to hold onto those ticket stubs (from the rained out May 25th event) and use them for admission to the June 8th event. This is an "Either Or" option for the use of those ticket stubs from the rained out May 25th event. Savings of up to $14!! MISSISSIPPI THUNDER SPEEDWAY INTRODUCES THE "DOUBLE THE DANS 2012 RACING TOUR"
MISSISSIPPI THUNDER SPEEDWAY is happy to welcome another Dan to the speedway microphones for the 2012 racing season! Veteran racing announcer Dan Deicher is joining the current voice of MISSISSIPPI THUNDER SPEEDWAY, Dan Bailey, to form a "Double the Dans 2012 Racing Tour" presentation for announcing the race action at the West-Central Wisconsin Dirt Track . . . The list of veteran racers was familiar during Coca-Cola Bottling Company of Winona night at MISSISSIPPI THUNDER SPEEDWAY Friday, but it was members of the "Youth Brigade" who flexed their young muscles and showed their strength by running hard, clean and fast. Every single division that hit the high banks on MISSISSIPPI THUNDER SPEEDWAY for green-flag action contained at least one driver who was either still in High-School, or at least young enough to remember the experience; and they all showed that they had the skill and equipment to not only run with the veterans, but in many cases, ahead of the veterans . 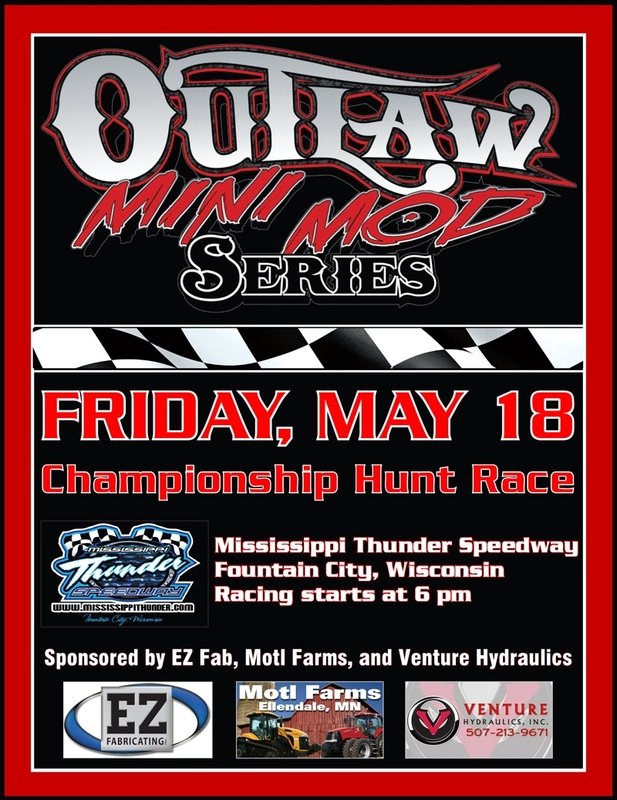 . .
Nathan Kilwine and the OUTLAW MINI MOD SERIES are excited to announce a special three-night schedule at MISSISSIPPI THUNDER SPEEDWAY! Friday night, May 18th, will be the first event of this special three-night series which will culminate with a $500 to win finale at MISSISSIPPI THUNDER SPEEDWAY on Friday August 17th. "We're really looking forward to this event!" said Kilwine when releasing the details for this special . . . It seems that every race track has a cast of competitors who are "Fan Favorites". 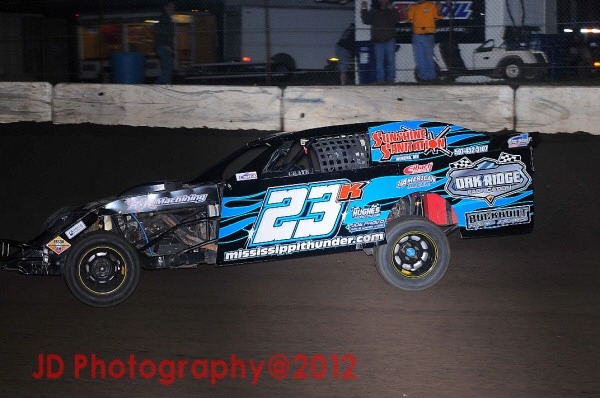 One of those "Fan Favorites" at MISSISSIPPI THUNDER SPEEDWAY is "Fast Freddie" Prudoehl. Some of it has to do with his age . . . at a spry 70 years old, who couldn't help but cheer for him. Some of it has to do with the fact that even at the age of 70, Freddie is a legitimate contender for a finish up front while he's strapped in behind the wheel of his "Yellow Deuce" WISSOTA Street Stock. And some of it has to do with that nearly never-ending smile that seems to ride his face like a perfectly sized suit. Friday night, May 11th, that smile was out in full force, and reflected by smiles on almost every face in the grandstands at MISSISSIPPI THUNDER SPEEDWAY . . . The building anticipation, the visual display, the growling thunder . . . and that was just the weather! The racing faithful, on hand Friday night at MISSISSIPPI THUNDER SPEEDWAY, didn't let cloudy skies and a water-logged forecast keep them away from the Fountain City dirt track; they showed up none-the-less, like Vegas-vacationers who ignore past results and decide to hit the Black Jack tables anyway in search of fun. Similar to the previous weeks 2012 season opener, also ran under the threat of approaching rain, the crew at MISSISSIPPI THUNDER SPEEDWAY once again put together tight program in an effort to get a full program in before the approaching rains soaked the area. They were so close. Before the early evening skies opened and dumped torrential down-pour of water on the area that had many whispering the name "Noah", all of the heat races and three of the six scheduled features had been scored in the books . . .
With threatening weather on the way, MISSISSIPPI THUNDER SPEEDWAY staff and officials knuckled down and focused on presenting a quick and exciting 2012 season opening event. Race fans who ignored cloudy skies, high winds, approaching rain and cool temperatures were treated to an exciting night of Dirt-track action presented by Fastenal. With Carl Edward's 2012 Roush-Fenway Racing NASCAR Sprint Cup #99 Fastenal Ford Fusion on display in the hospitality area, racing fans filled into the grandstands and prepared for the a mixture of local racers and traveling hot shoes as the track regular Jailhouse Saloon WISSOTA Street Stocks, Oakridge Fabrication 600 Mods, and all new M.T.S. Pure Stocks played support to the $4,000-to-win USMTS National Championship Series and the Industrial Material Surplus Iron Man Challenge featuring USRA B-Mods . 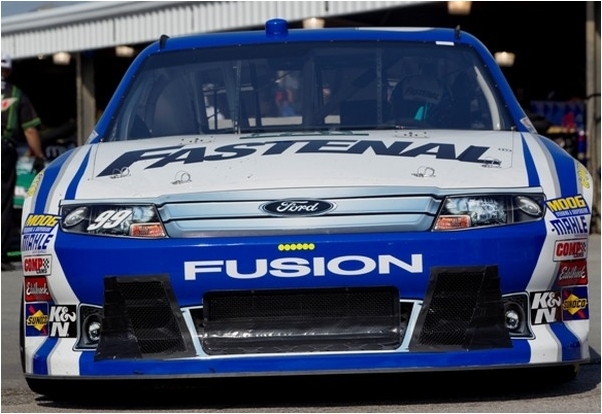 . .
MISSISSIPPI THUNDER SPEEDWAY is excited to announce that Carl Edwards' 2012 NASCAR Sprint Cup #99 Fastenal Ford Fusion will be on display Friday April 27th at the 2012 season opener! MISSISSIPPI THUNDER SPEEDWAY owners Bob & Paula Timm and Tom & Tina Lockner are thrilled about Fastenal's invovlement with the USMTS National Touring series special event that is scheduled to begin a full season of dirt-track racing excitement for the race fans. "We're really excited to have Fastenal along for the ride at the 2012 season opener this year." said Timm, "By getting the racing season going with some great thunder, with the USMTS National Touring Series presented by Fastenal, and to also be able to present the #99 Fastenal Ford Fusion will be a real treat for all race fans." . 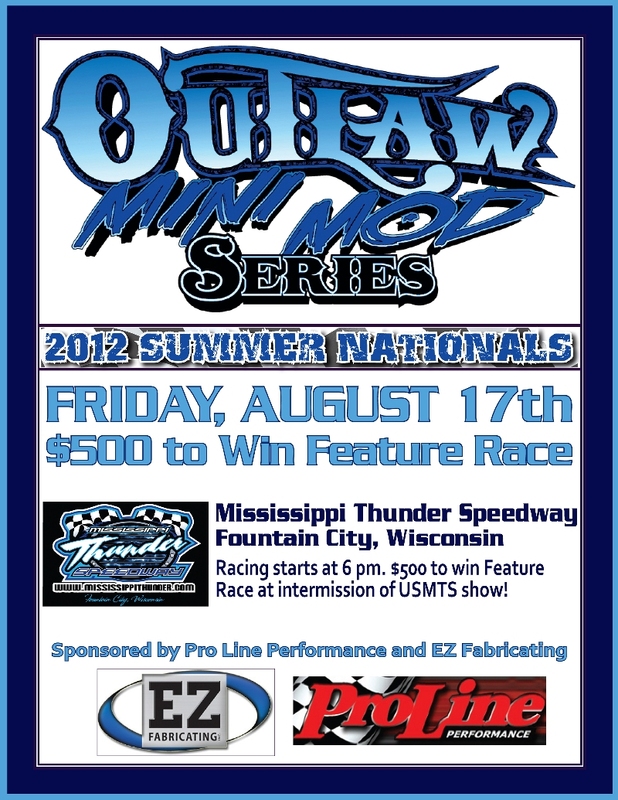 . .
FASTENAL PRESENTS USMTS NATIONAL TOURING SERIES AT MISSISSIPPI THUNDER SPEEDWAY'S 2012 SEASON OPENER! 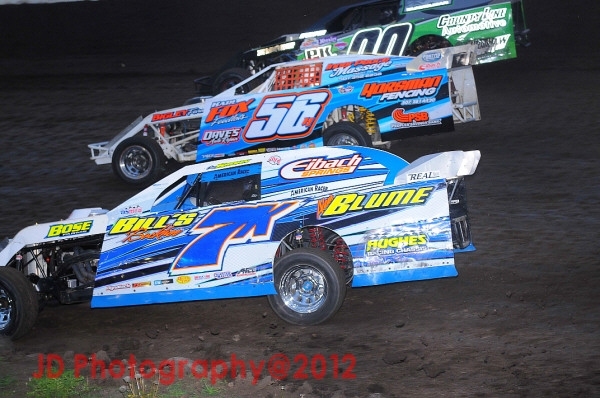 Fastenal Company is joining forces with MISSISSIPPI THUNDER SPEEDWAY to present the USMTS National Touring series at the 2012 season opener on Friday April 27th! Racers and race fans alike have come to know that the United States Modified Touring Series (USMTS) presents some of the best dirt modified racing action throughout the United States . . . and MISSISSIPPI THUNDER SPEEDWAY owners Bob & Paula Timm and Tom & Tina Lockner are excited to welcome them back to the Fountain City, WI speedway for the 2012 Fastenal Season opener . . .
As in years past, the first steps to an energetic new racing season will begin with the official unveiling of racing hardware at the annual pre-season car show. But, as a twist this season, the MISSISSIPPI THUNDER SPEEDWAY Car Show will be accompanied by a Swap Meet! Saturday April 7th, from 10:30 to 1:30, the 2012 MISSISSIPPI THUNDER SPEEDWAY Car Show / Swap Meet will be held at Sugarloaf Ford (on the sunny side of Highway 61!) . 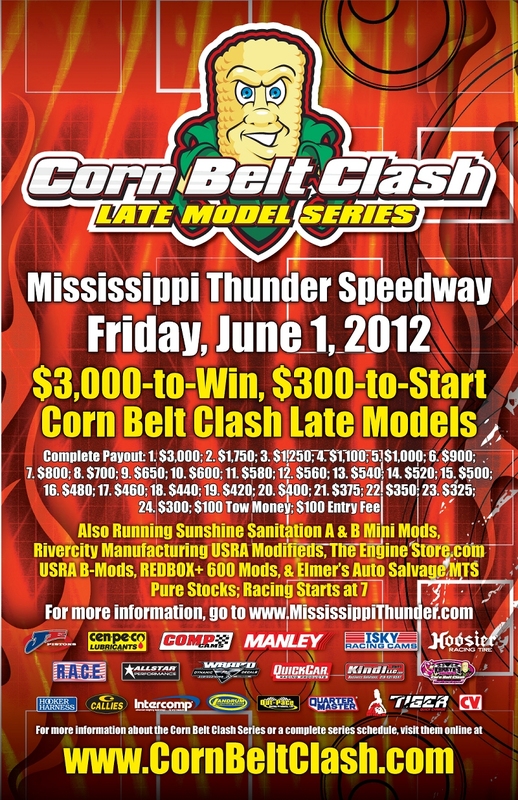 . .
MISSISSIPPI THUNDER SPEEDWAY officially released a tentative schedule for the upcoming 2012 racing season. 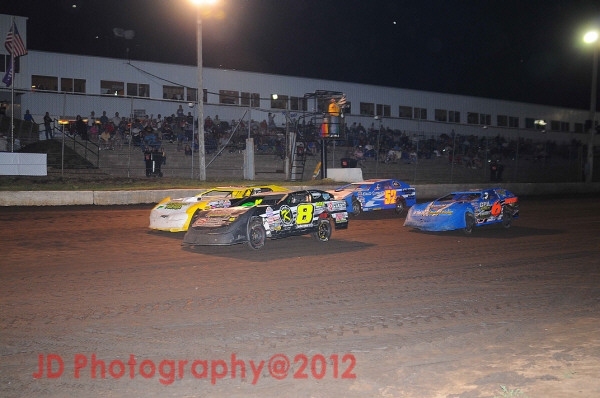 Continuing an arrangement set up by speedway owners over the first three years of racing at the Westcentral Wisconsin facility, action for the 2012 season at the lightning-fast 3/8-mile dirt track will be highlighted by several special events . 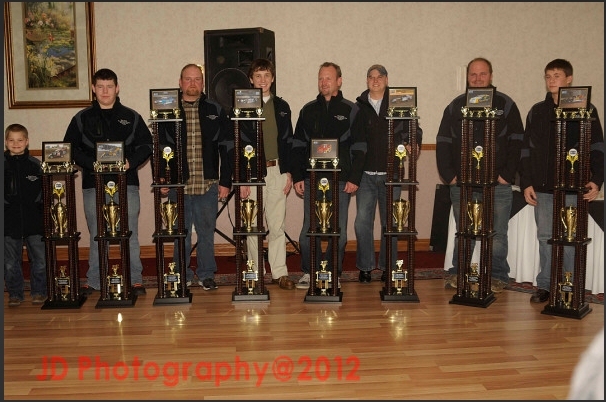 . .
MISSISSIPPI THUNDER SPEEDWAY officially announced, during the 2011 Awards Banquet, that the Pure Stock class will be included in the 2012 competition schedule. 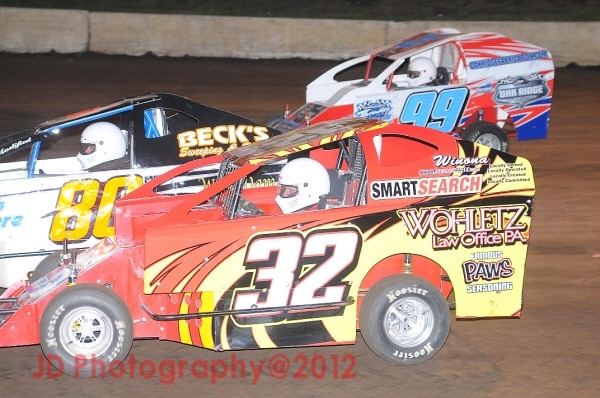 In an effort to make entry into the 2012 Pure Stock division as easy and cost effective as possible, MTS owners are also excited to make several announcements that should make the division a great option for any fan of Stock Car racing - regardless of their background . . .